I would love to have the option to view (and edit) the text of selected multiple notes as one document in the one window. So that I can see all the notes with the @tag for example as one text document. 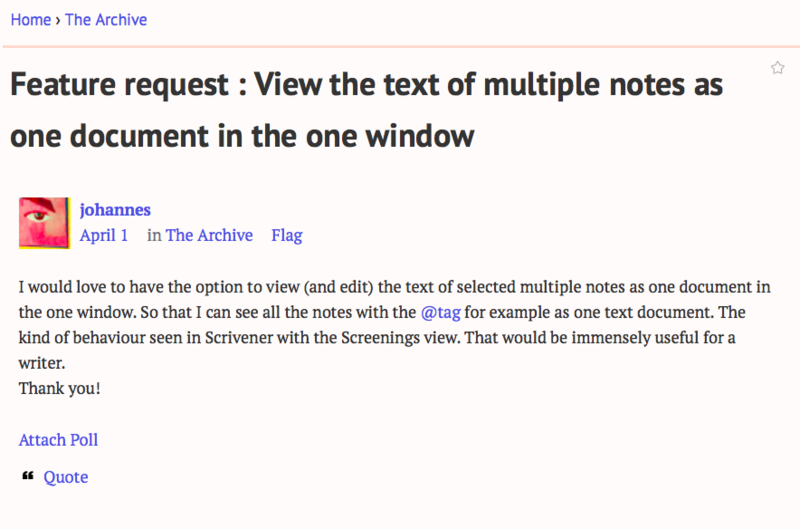 The kind of behaviour seen in Scrivener with the Screenings view. That would be immensely useful for a writer. Edit is top right (the cog). looking forward to v2 already! Screevenings is already present for any kind of search in Sublime_ZK. You can edit all matching notes, and save it. Just use Find - Find in Files, or shortcut shift-command-F. It will find ANYTHING in your Zettelkasten Just be sure to expand the bottom search window so you can see better the results for editing. I'll say that Ulysses is a great tool for longer composition, that is somewhat compatible with the direction the Archive seems to be going. It is like a Scrivener for Markdown—but in my opinion, much better. You might look to it for inspiration on how to approach this. I wish I could use Ulysses for general note-taking purposes, but its search is not good enough, snappy enough, and integrated deeply. This is why, for notes, I used Notational Velocity / nvAlt and now The Archive. If these functionalities can be brought together, that will be great. I just wouldn't want it to cost the simplicity and directness of search and browsing. @micahredding I know Ulysses a bit, but I don't know which part of it you have in mind that's going into this direction. Ulysses can group, "glue", split and merge together notes. Split takes one note and makes two. Merge takes two notes and makes one. "Glue" is attaching multiple notes together for a period of time, to enable certain kinds of workflow. Grouping is like making a folder or directory. I think the Archive could benefit from tools for splitting and merging. More speculatively, I think it could benefit from some kind of analogue of the Glueing feature—holding together a set of notes while working on them, for example. This could be implemented using specialized "browser tabs", perhaps, as seems to be suggested here. I'd also think it could benefit by being able to preview/expand inline references, so that your outline notes could be previewed as a full book. This would accomplish what Ulysses is able to do with grouping, but in an approach more similar to iA Writer. Thanks for providing the details! Split & merge are planned features and will come in the not-to-distant future! Glueing seems to be similar to something Sascha and I wanted to experiment with for a long while, but it'll take long to ship something like it since it's a lot of custom work in unexplored territory on my side.